THIS is the first daily soap after Hum Log that has been shot entirely in Delhi. And, hopefully, that is not the only flag that Apas Mein has to wave. Omesh Saighal directs the serial that has been ambitiously planned to run for over 500 episodes with screenplay and script jointly by Kamleshwar and D.N. Goswami. Though the theme of Apas Mein, telecast every Monday 2.30 p.m. on DD Metro, is woefully hackneyed, the soap catches the viewer’s attention mainly because of renowned Hindi writer Kamleshwar’s masterly touch. It is the story of three families — two rich and well-connected and the third of modest means which has been forced to return from Pakistan in the wake of the formation of Bangladesh. The storyline revolves around the deterioration of public morality. It targets corruption in all its manifestations and says that in this kalyuga not only does corruption pay but it also finds its rationale and justification. As a solution to the problem of corruption, the serial suggests the Gandhian way of life which by now most Indians have long forgotten. Interesting concept and worth a dekko. But be warned! It has a star cast comprising artists like Sushma Seth, Raman Kapur, Rama Vij, Kimti Anand and Yogesh Sehgal — all of who are from Delhi! Her abounding talent has her constantly shuttling between the small and the big screen. But that Neena Gupta is a showbiz personality who merits a second and a third look is more than evident with serials like Saans and Pal Chchin. 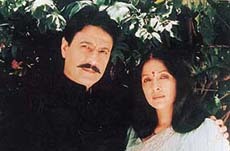 Arun Govil & Neena Gupta in Saanjhi... Sensitive treatment. The common factor in most of her serials is the focus on the complex man-woman relationship. The serials are neither brash nor moralistic but touch the sympathetic chord of the viewer. Now she’s back with another man-woman relationship serial, Saanjhi on Zee TV, every Friday at 8.30 p.m. The setting is rural India, where landlords and greedy moneylenders still exist. Amar is a wealthy, though compassionate, landlord who is happily married to Kanak. However, he has one grievance that he will never become a father as Kanak cannot conceive. The story takes a poignant turn when he secretly marries the daughter of a poor peasant in exchange for waiving off his dues. The conflict starts when Amar brings his new wife to his house without the knowledge of Kanak. Though the story may have spawned a million versions yet, at the hands of Neena Gupta it comes in for special and sensitive treatment. The serial is rapidly climbing the popularity charts and going by the viewer response, Saanjhi could yet be another blockbuster under her belt. It was the first time His Holiness the Dalai Lama went to see a Hindi film. And all Bollywood-based shows should have gone to town over the event considering Shah Rukh Khan was the host and the film was Asoka. But they either missed it or did not think it important enough to be aired. Khabrein Bollywood ki : Beyond Mumbai. That’s precisely the gap that Khabrein Bollywood Ki wants to fill. To be telecast on Thursday, Friday and Sunday on DD Metro, the show will focus on film-based happenings outside Mumbai which channels and even the national press tends to ignore. "We would be moving out of Mumbai to other cities for Bollywood related news which does not get adequate publicity," says Anuradha Prasad of BAG Films, producers of the show. A panel of film journalists will keep an eye on the Bollywood happenings outside Mumbai. To be hosted first by Mandeep Bevli and later by Anchal Gulati, the producers have decided to keep their hosts rotating to maintain freshness in the programme. So, if you are keen Hindi film buff, but have been on an overdose of Mumbai, this is your chance to catch-up with Bollywood beyond the confines of Mumbai. Meet Peter Jay. He leaps into boats, romps with chimpanzees, jumps into hot air balloons, crawls through archaeological digs and takes his viewers on a fascinating armchair journey through space and time to discover how human beings became wealth-creators. Road to riches: Probing the origins. Visiting 19 countries he explains the need of humans for money and their history of accruing and spending it, its impact on democracies and on lifestyles and aspirations. Being telecast every Saturday at 1.40 p.m. on BBC World through February, Road to riches traces the history of the world and how people managed to garner wealth. The first week traces man’s long list of greed and treachery and why he started producing goods for his own benefit. Archaeologists have traced the first production in present Jordan. From Jordan, Jay visits the island of Yap where money is still made of stone. His exploration brings him across such fascinating tales like the discovery of 1000-year-old documents in ancient synagogue, in Cairo, which reveals how ancient Arab merchants took enormous risks to earn profits for their business. If you are curious to know about the origin and development of all economic activities in the world, this programme will definitely have most of your answers. In the North-East corner of India, there is a flying creature so ferocious that it is feared as much as the tiger. But it couldn’t be more different. It is an insect, a honeybee in fact. Honeybees on the Magic Trees of Assam: Single-minded attraction. Despite their seemingly innocent name, these are no docile domesticated bees. The giant honeybees are among the most aggressive of all creatures. They have a reputation for attacking en masse, to the point that local people have learned to live with and respect them. Every year, these bees follow the same migratory route to their final destination — The Magic Trees of Assam, on Discovery Channel Thursday, February 7 at 7 p.m.
For years, Austrian scientist Dr Gerald Kastberger has been mystified by the bees’ tantalising journey, dedicating his life to studying what makes these magic trees of Assam so special. They are more than 160 kilometres from the bees’ homes in the foothills of the Himalayas, yet the bees unerringly find them. Viewers follow the scientist in his quest to discover the secrets of these mysterious killer bees and their magnetic attraction to the magic trees. Often filmed from a bee’s-eye-view, this programme takes viewers inside the fascinating lives of the world’s largest honeybee and the world from their perspective. As kids most of us have enjoyed his comics. So have a lot of grown ups. Now meet Asterix on the small screen. For the first time on Indian television the Gaul Hits Toon Time at 7 p.m. on Sabe TV Monday through Friday in adventure after adventure. Asterix the Gaul.. An all-time favourite. 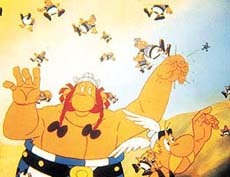 The series dates back to the rule of Julius Caesar and stars Asterix and his best friend Obelix. It is about the rivalry between Caesar and the wits of the villagers of Gaul. No matter what the Romans try, they end up getting pipped by these shrewd little warriors. Asterix and Obelix are two boisterous Gauls who live in a village that is the last French region holding out against the might of the Roman Empire. Most of the perilous missions are entrusted to Asterix who is protected by the village druid Getafix’s magic potion that gives him superhuman strength. He is a clever warrior who knows when to use brain and brawn. Many of the comic’s diehard fans would be a bit disappointed, as the series has been dubbed in Hindi. Nothing wrong with that, except it takes away from the original flavour of the comic book. Ladies, this one’s exclusively for you. Worried about the influence a pretty secretary wields over your husband? Do not know how to cope with a troublesome mom-in-law? More seriously, is your husband or his family forcing you to abort a female foetus? If the answer is yes, you neither have to go to a psychologist nor have to write long letters to a grievances column. You can now unburden yourself and get professional advice on Kashmakash every Friday at 4 p.m. on Star Plus. The talk show directed by journalist Satya Saran, tackles issues which concern today’s women. 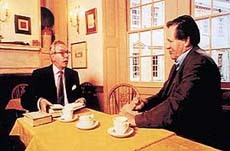 Most of the issues are derived from the numerous letters and personal interactions that Saran has had with women in the course of her editing a women’s fortnightly. Renuka Shahane plays the perfect host as she discusses these issues with experts who suggest how best to deal with vexing situations. Interestingly, very few viewers know that Shahane has a degree in clinical psychology and is well equipped to deal with the myriad of problems faced by the common Indian woman. So, ladies, you are in safe hands!